I hope that the weather has not caused you too much disruption this week and that you have been able to enjoy the snow. Those children able to make it in to School on Wednesday had a wonderful day. 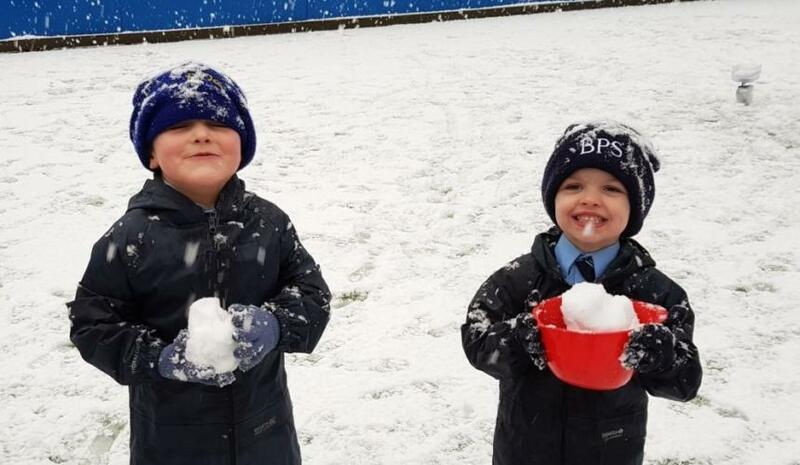 We continued with our specialist gymnastics and music lessons, along with other classroom based lessons, but then enjoyed a great time playing out in the snow. The children played beautifully together and it was a joy to witness. Due to their impeccable behaviour, we were able to enjoy sledging and snow ball fights, using the BFG and tree-house. A day to remember for sure! Wednesday was an example of excellent staff teamwork, a quality that we instill within our children and that can, in itself, bring great rewards and satisfaction. Our committed staff made it in to School to ensure we could deliver care and education to the children. Staff helped clear snow to ensure that we were safe to cope with the events of the day and following this, to quickly restore the School to normal working order soon after. It really was a day that illustrated everything wonderful about Brabyns. These kind of snow days are ones I remember well as a child and now as a teacher. We were also delighted to welcome back some alumni and children from other local Schools (as we were the only School in Marple open). As you know we will always endeavour to stay open if safety permits, but always leave the decision to come in to School down to the parents / staff. There are some great videos of the children which you can watch here and there are lots of photos on Facebook. I hope you are able to continue to enjoy the snow as a family over the weekend.